In the UK approximately 1 in every 1,000 people have lost a limb through an accident, illness or military action. Samantha Payne and Joel Gibbard are the co-founders of Open Bionics and the pair identified a serious gap for affordable, comfortable and well-functioning prosthetics in the market. Currently if you lose your hand, there are only two prosthetics available which are both fairly rudimentary. One of these being a hook-type prosthetic, which is very primitive and does very little to replicate an actual limb and the other being a gripper prosthetic, which merely completes a simple action of opening and closing. Currently a bionic hand with multi-grip functionality costs up to £60,000 from private providers. Payne and Gibbard viewed this as simply too expensive and knew that it was possible to create a better solution. The pair founded Open Bionics in 2014, and made it their mission to find a solution for creating a more cost effective solution for prosthetic limbs. It was crucial that they could not only reduce costs, however also create a product that could comfortably and practically fit every individual user. 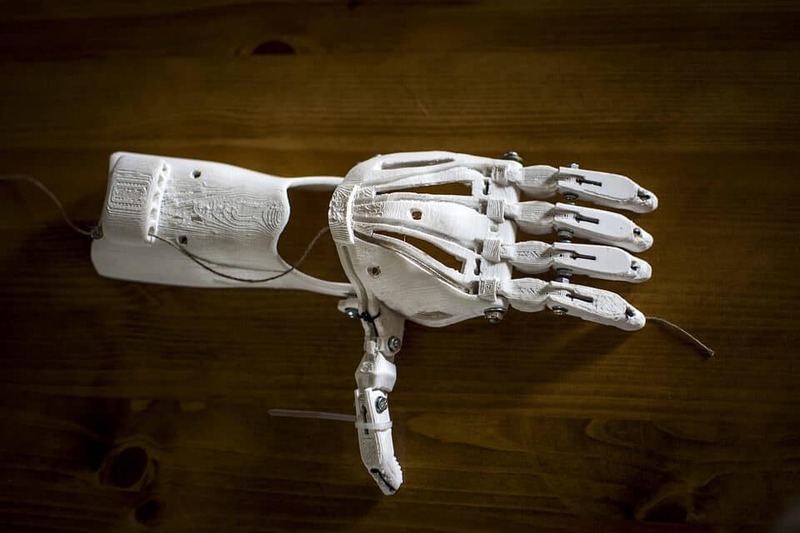 The big innovation and how Open Bionics could save substantially came from using 3D scanning and printing. 3D scanning was used to take the initial fitting, which takes approximately two minutes and then the socket can be created with 3D printing within 24 hours, whereas traditional methods of creating prosthetics can take weeks and months. Payne and Gibbard at this point really saw the potential to revolutionise the prosthetic design and fitting process and give some hope back to those that had lost a limb. Open Bionics was also a significant development for those children born without hands. The team have now created a bionic hand small enough for those as young as eight, which was significantly ground-breaking in the prosthetics field. Recently Disney has teamed up with the company to create the next generation of bionics, which are Iron Man, Frozen and Star Wars themed bionic hands. This gives prosthetic kids something to be excited about and feel proud to wear. The kids are now not only getting a medical device, they are getting a hand inspired by their favourite character. The team at Open Bionics will continue to further advance and build on their technology, especially after recently receiving a £100,000 award to support a six month trial to demonstrate the feasibility and technology of the product. Open Bionics’ innovative products supply a ground-breaking alternative to prosthetic limbs and the experimental processes that the company is carrying out is considered research and development. This makes Open Bionics eligible to receive a significant tax rebate on the R&D expenditure accumulated. The current available tax relief on R&D activities is very generous, the find out more contact a Swanson Reed R&D specialist today.